Here’s how two new recruits got on in their first attempt at snowsports. I’m going on my first ever ski holiday with Leeds Snowriders to Rise festival at Christmas, so I thought it was wise to learn the ropes before I go. I always wanted to ski and Rise is the perfect holiday for skiing and partying. I haven’t been on a uni ski trip yet and I would definitely regret not going! I chose skiing because I heard it’s easier and it seemed more up my street plus a lot of my friends ski. I have really bad balance so I didn’t want to try snowboarding and since I have no experience in snowsports, I was worried about being safe and in control of the skis. During the lessons, I was surprised how quickly I picked it up and learned to stop myself easily. The skiing was way more fun than I anticipated and we even got to go on the main slope in our first lesson! Leeds Snowriders have a super friendly committee who made me feel welcome straight away and all the beginners got free Line-S New Sliders t-shirts. I’m now good friends with the other beginners and the majority are coming on the ski trip. I cant wait to get more involved with the club, especially after the ski trip and in second semester. I chose to learn how to snowboard because I wanted to be a part of a new society in my first year of uni, make new friends and get some experience behind me if I end up going on the ski trips. I went for snowboarding instead of skiing because I’ve tried skiing before and always wanted to give snowboarding a go. I had no previous experience with snowboarding, and had heard it was hard to learn but easier to master, so I was apprehensive how well I would pick it up. Luckily I found it easier than anticipated and loved it! I enjoyed both the lessons we had and liked being in a small group of 8 people. It meant I could socialise with the other snowboarders who were on the same level as me in experience. Being able to ride on my own without any help was a really good feeling! Unfortunately I’m not going on the Christmas trip with Leeds Snowriders but I hope to make it onto the Easter Trip in Val Thorens. I’m looking forward to progressing my skills until then and getting to a level where I can board on reds and blues. 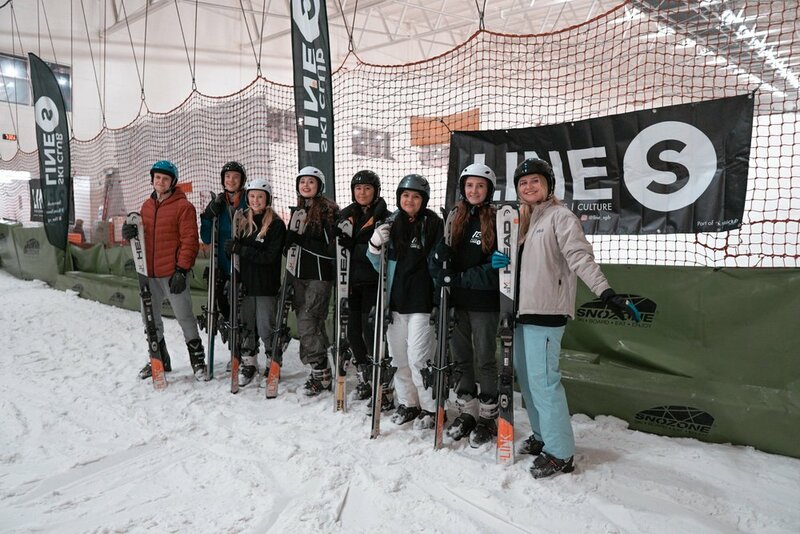 Leeds Snowriders have really helped me progress since taking lessons is a great way to get involved in the club. With socials happening throughout the year, there is plenty that the club have planned for us to get stuck in to. It’s such a big society and everyone is very like-minded and up for a good time which is great! Leeds Snowriders lessons took place at Snozone, Castleford. Find out more about learning in the UK here and Leeds Snowriders here.